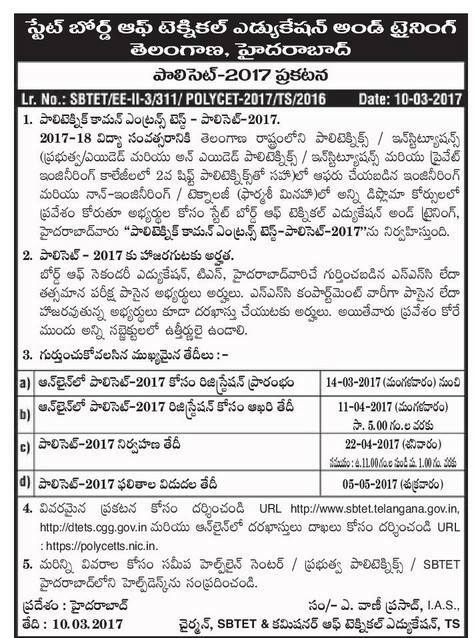 TS Polycet 2017 Notification,Application Form,Exam Dates,POLYCET 2017, TS CEEP 2017 Exam date, TS CEEP 2017 Notification, TS POLYCET 2017,TS POLYCET 2017 Application Form / Notification / Exam Date polycetts.nic.in, TS POLYCET 2017 Application form, TS POLYCET Exam date 2017, TS POLYCET-2017 Online Registration @sbtet.telangana.gov.in | TS POLYCET Application Form Download | Apply Online for Polytechnic Entrance Exam 2017 State Board of Technical Education of Telangana State Released | Apply Online for Polytechnic Common Entrance Test 2017 at http://sbtet.telangana.gov.in | Schedule for POLYCET 2017 | Important Dates to remember for TS Polytechnic Education | http://ploycetts.nic.in | Board od Technical Education, Telangana State has released Common Entrance Test Notification for the Year 2017 | Date of Examination for Ploytechnic Entrance Test | Download Hall Tickets for POLYCET 2017 | Results for Polytechnic Entrance Test 2017 | ts-polycet-2017-online-registration-sbtet-dtets-polycetts-telangana,TS POLYCET Notification 2017,TS POLYCET 2017 – SBTET Telangana – Polytechnic Entrance Exam,TS POLYCET 2017 Application Form,TS POLYCET 2017 Apply Online,TS POLYCET 2017 Notification,Eligibility Criteria,Application Fees,Important Dates,How to Apply for TS POLYCET 2017,TS POLYCET Pattern 2017,Telangana #Polytechnic Entrance Test 2017/#TS #POLYCET 2017:The State Board of Technical Education and Training, Telangana State, Hyderabad has issued the Polytechnic Common Entrance Test (POLYCET) 2017 schedule on March 7th, 2017 and the detailed notification has be released 8th March, 2017. The SBTET has decided to conduct the POLYCET on 21st April, 2017 and the results will declared on or before May 10th and also the first phase counselling will be conducted in the month of May. TS POLYCET 2017 notification, Online Application Form, Last date, Fee details, How to Apply, Hall Tickets, Exam Date, Results, Admission Counselling Dates details given here. TS POLYCET 2017 Notification Exam Dates | Telangana,TS POLYCET 2017 Notification: TS POLYCET Notification is announced by State Board of Technical Education, Telangana. Telangana State Polytechnic Common Entrance Test is also known as TS POLYCET is a state level entrance exam conducted for Telangana State to get admission in various polytechnic colleges of Telangana State. The exam is conducted by Telangana State Board of Technical Education and every year huge number of candidates will appear for the exam. We here provide you complete details of TS POLYCET 2017. 1.The candidates will get the TS Polycet 2017 Application Form through the official portal. 2.The form will be available through online mode. 3.After filling the application form completely, candidates need to keep the print out of application form for future use. 4.The application form will be available from the 1st week of March tentatively. 1.The applicants must belong to the Telangana state with holding a certificate of permanent residence. 2.The applicants must be qualified the 10th or SSLC or its equivalent qualification from state board or any other government recognized board. 3.The applicant pursuing to the qualifying examination may also eligible to register. 4.Applicants having failure in any subject of qualifying examination in the year of application can also apply for the exam. 5.There is no age limit set for appearing to this examination. 2.No. of Questions: There will be 120 Multiple choice questions from class X Physics, Chemistry, Biology, Mathematics and English. 3.Duration: The duration of the exam will be two hours. 4.Marking Scheme: All questions will carry equal marks.